Triage; hundreds wait for treatment. We Hitched a bus ride with these folks to the town of Limon. 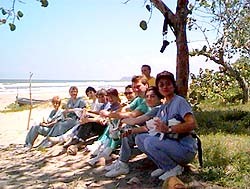 This was a major medical project, covering at least three towns on the coast Caribbean Coast of Honduras. Funded and operated by Arkansas church Christ the King, these folks shipped a major quantity of equipment and drugs into Trujillo, the base camp. 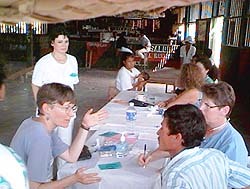 For a full week over a hundred people worked themselves to exhaustion, diagnosing, proscribing and supplying drugs to sixthousand three hundred Hondurans in need at three sites as well as at Trujillo hospital/convent/orphanage/jail. The Mission organizers are already talking of mounting another mission next year, and I hope to go again. The greater part of the patients that were seen suffered from parasite related diseases, or illness caused by dietary habits. Also much in evidence were children suffering from asthma brought about by the continual exposure to smoke in the small thatched dwellings. Smoke is the only cost effective way most of the population has to keep away malaria causing mosquitoes. It was quite an eye-opener seeing these doctors and nurses giving of themselves to the last ounce of their energy without stint, and merely for the good of doing good. In the great scheme of things, the impact of this aid has on the town and rural communty may seem to be insignificant; but were it not for this relief, thousands of people would have significantly more misery in their life. If there were more activity like this in the World, it would surely be a better place.